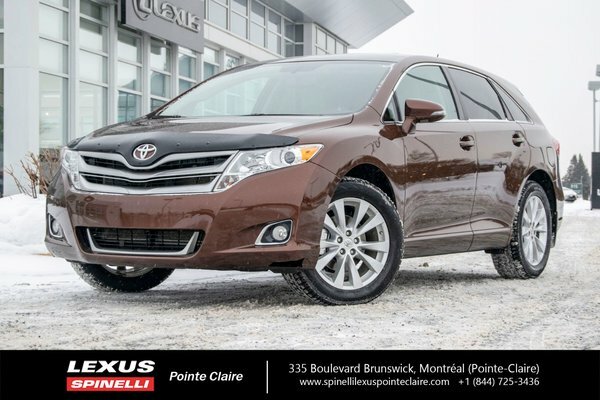 You simply must see this beautiful 2014 TOYOTA VENZA XLE AWD with only 85 870 kms. Great color combination of Sunset Bronze Mica (Brown) on cream colored leather. Very clean. This car was traded in for a brand new Lexus. The previous owner purchased the vehicle Certified Pre Owned from a Toyota dealer and faithfully maintained it at the dealer. Never accidented. CARFAX vehicle history report available. Inspected by our Lexus certified service department. Oil and filter changed as well as air and cabin filter changed. Brand new brakes (rotors and pads) on all 4 wheels. This CUV is ready to go!